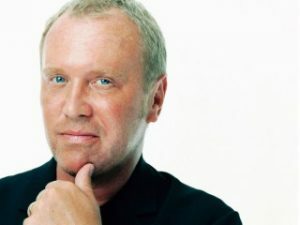 Michael Kors is an American fashion designer. He is considered one of the world’s top fashion designers. He is recognized for making women sportswear. Kors has dressed such celebrities as Jennifer Lopez, Charlize Theron, Catherine Zeta-Jones, Gwyneth Paltrow, Madonna, Barbra Streisand, Sharon Stone, Anjelica Huston, Sigourney Weaver, Rene Russo, and Liv Tyler. He is also known as a TV personality on the hit competition, Project Runway. He was born on August 9, 1959 as Karl Anderson, Jr. in Long Island, New York to Karl Anderson and Joan Hamburger. His father was of Swedish descent and his mother is Jewish. He married his long-time partner Lance LePere in August 2011. Birth Name: Karl Anderson, Jr. He studied fashion design at The Fashion Institute of Technology. He graduated from John F. Kennedy High School in Bellmore, New York. *He belongs to Jewish and Swedish descent. *In 1999, he was named womenswear designer of the year. *He designed Michelle Obama’s dress for her first official portrait. *Became the youngest person to receive the Geoffrey Beene Lifetime Achievement Award from the CFDA. *His mother remarried and he was adopted by Bill Kors, he changed his last name, and picked out Michael on his own. *Follow him on Twitter, Facebook, Pinterest, YouTube and Instagram.